A Red Cross worker was among the 43 people killed in a massive car bombing in southern Afghanistan, the aid organization said Wednesday. A tanker truck full of explosives went off Tuesday in front of a Japanese construction company in Kandahar, officials said. The blast was so intense that windows shattered in homes a kilometer (0.62 miles) away. An Afghan water engineer working for the International Committee of the Red Cross was killed when the blast collapsed the ceiling of the room he was in, the organization said. Abdul Wadood, 48, had worked for the Red Cross for six years, the aid group said. He leaves a widow and 10 children, who were not home when the blast occurred. “The ICRC is deeply shocked by the death of a much-loved colleague, and extends its deepest sympathy to Mr. Wadood’s family,” the organization said in a statement. No one has claimed responsibility for Tuesday’s attack, which happened in a largely residential neighborhood, the Red Cross said. It left 43 people dead and 75 wounded, said Col. Fazel Ahmad, the chief police commander of Kandahar province. Most of the victims were civilians, the Red Cross said, and children were among them, Ahmad said. 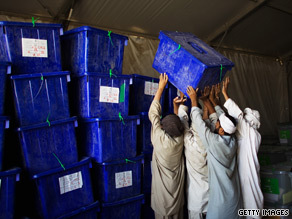 The bomb came as Afghan election officials continued to count ballots in the country’s presidential election. On Tuesday they said partial election results put incumbent President Hamid Karzai ahead of his main rival by a slim margin. Based on 10 percent of the votes counted, Karzai received 212,927 votes compared with rival Abdullah Abdullah who received 202,889 votes. Full results are expected to be released in mid-September. If no candidate gets 50 percent of the vote, there will be a runoff — most likely in mid-October. Abdullah, who was foreign minister under Karzai, has accused the incumbent of rigging the August 20 elections in his favor.